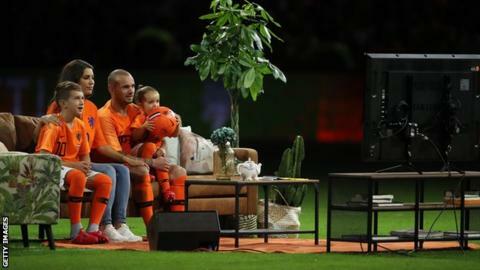 Sat in a mocked up living room in the middle of the Johan Cruyff Arena pitch with your family, watching goodwill messages from your peers - it is an unusual way to sign off an international career. Wesley Sneijder was given this very farewell after ending his 15-year Netherlands international career with a victory over Peru. The midfielder played 62 minutes of the 2-1 win, but after the game was seated on a sofa with his wife and two children to watch pre-recorded messages from former team-mates and managers. The crowd in the stadium also held aloft banners celebrating the 34-year-old, who began his international career in April 2003 and ends it with a national record 134 caps, in which he scored 31 goals. Lyon forward Memphis Depay, formerly of Manchester United, scored both goals as the Dutch came from behind to win, his second coming seven minutes from time. Pedro Aquino had put the South Americans in front in the 13th minute. Match ends, Netherlands 2, Peru 1. Second Half ends, Netherlands 2, Peru 1. Offside, Peru. Pedro Gallese tries a through ball, but Ray Sandoval is caught offside. Attempt missed. Quincy Promes (Netherlands) right footed shot from outside the box is close, but misses to the left. Assisted by Tonny Vilhena. Attempt saved. Jefferson Farfán (Peru) header from the centre of the box is saved in the centre of the goal. Assisted by Christian Cueva with a cross. Substitution, Peru. Wilder Cartagena replaces Yoshimar Yotún. Corner, Peru. Conceded by Justin Kluivert. Substitution, Netherlands. Tonny Vilhena replaces Ryan Babel. Substitution, Netherlands. Justin Kluivert replaces Ruud Vormer. Foul by Sergio Peña (Peru). Goal! Netherlands 2, Peru 1. Memphis Depay (Netherlands) left footed shot from the centre of the box to the bottom right corner. Attempt blocked. Quincy Promes (Netherlands) right footed shot from outside the box is blocked. Assisted by Memphis Depay. Attempt blocked. Jefferson Farfán (Peru) right footed shot from outside the box is blocked. Assisted by Christian Cueva. Corner, Netherlands. Conceded by Luis Advíncula. Substitution, Peru. Sergio Peña replaces Pedro Aquino. Attempt missed. Davy Pröpper (Netherlands) right footed shot from outside the box is too high. Attempt blocked. Daryl Janmaat (Netherlands) left footed shot from the right side of the box is blocked. Assisted by Memphis Depay. Daley Blind (Netherlands) wins a free kick in the defensive half. Foul by Horacio Calcaterra (Peru). Matthijs de Ligt (Netherlands) wins a free kick in the defensive half. Substitution, Peru. Luis Abram replaces Ánderson Santamaría. Foul by Ruud Vormer (Netherlands). Nilson Loyola (Peru) wins a free kick in the defensive half. Foul by Virgil van Dijk (Netherlands). Foul by Davy Pröpper (Netherlands). Corner, Netherlands. Conceded by Christian Ramos. Ánderson Santamaría (Peru) is shown the yellow card for a bad foul. Foul by Ánderson Santamaría (Peru). Attempt missed. Horacio Calcaterra (Peru) right footed shot from the right side of the box misses to the left. Assisted by Luis Advíncula. Attempt saved. Memphis Depay (Netherlands) right footed shot from outside the box is saved in the centre of the goal. Substitution, Peru. Horacio Calcaterra replaces André Carrillo.